I wasn’t one of the insane people that camped outside of Target early this morning for the running of the amiibo. Instead, I drove to Toys R Us a little after it opened at 10 am. My goal was to get that sweet Splatoon 3 pack to go with my Splatoon download. I could’ve gone to Gamestop or Best Buy since they’re all in the same area, but I went to TRU because I figured I’d have better luck there. When amiibo first launched last November, they were one of the only stores to have the elusive Villager (and they sold out not too long after, I’m sure). When I walked in and saw the line behind the customer service desk, and people w/ arms covered in amiibo, I thought, “Crap! I’m too late!”. But, I pressed on towards the back to the games section. And to my surprise, there were plenty of 3 packs left, as well as the boy and girl figures. Even better, Wario and Pac-Man! They even had Charizard and Greninja, but they were snatched up quick (I think Greninja was only available to those that preordered, or very lucky people, and that’s exclusive to TRU, I believe). I happily grabbed the 3 pack and Wario, and I wanted to get Pac-Man, but I couldn’t justify spending $60+ on one trip, especially since I just spent over $60 on Splatoon in the eShop. To placate myself until I get one, I took some pics of the Pac Attack as I left. Maybe I’ll get lucky on Amazon today when they open the floodgates, but I doubt it. One of my fellow amiibo hunters let me take my spot back in line while I was deciding on Pac-Man. You’re great, guy! Let’s talk about the cool folks I spent time with! One guy I recognized from Best Buy’s Nintendo events from the past 2 years. He and his girlfriend/wife (?) are very involved with the local Streetpass group. He’s great! The people I hung out with talked about their experiences getting the new amiibo. Some ordered Robin and Lucina online. The one guy from earlier mentioned how he hated the gold and silver Marios (there were plenty of silver ones, in case you wanted one). One person trashed the store policies changing, and how some people were able to get more than 1 of a character, and others weren’t. The whole process took no more than 30-45 minutes. I really enjoyed it more for hanging out with fellow amiibo/ game fans. 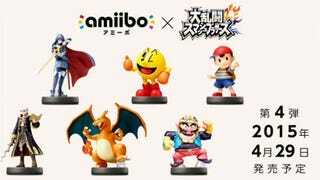 I’ll share pics of my haul later today, but I hope you amiibo freaks got lucky in your quest!